Bezbarwny rozpuszczalnik pochodzący z destylacji rafinowanej ropy naftowej. Jest lepszym rozpuszczalnikiem do substancji oleistych takich jak (farby olejne) niż terpentyna, a do tego kolejną zaletą białego spirytusy jest to, że jest on mniej palny i mniej toksyczny. Due to the great demand of our popular White Spirit, we have decided to also offer it in a new 100ml bottle, practically the same amount you get in three of our smaller 35ml bottles. The big difference is that this new larger bottle is even cheaper than two of our smaller ones. A great offer for all of those who need and use lots of white spirit for their work. 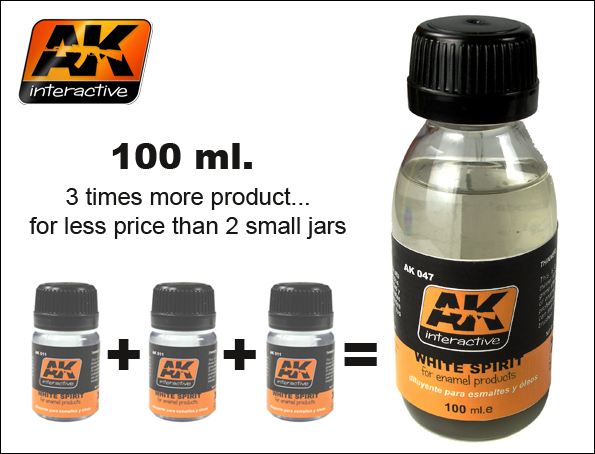 The AK Interactive white spirit is perfectly adequate for blending and for doing any streaking effect, for working with Oil and in general all techniques that require lots of elaboration. Exclusively for use with enamel and oil paints.